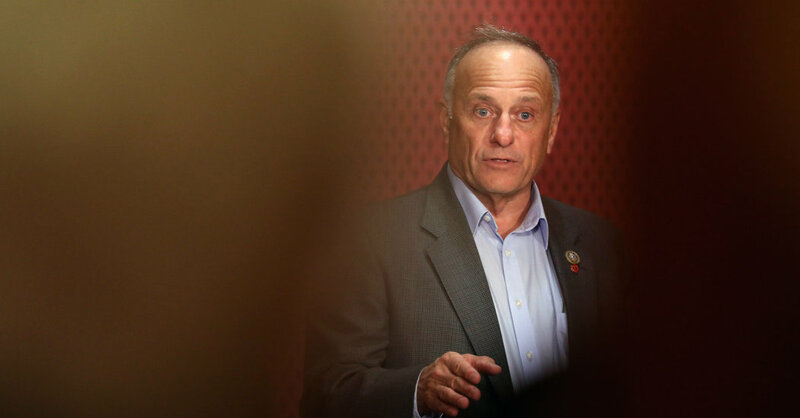 Representative Steve King, a Republican from Iowa who has a history of making inflammatory remarks, barred the state’s largest newspaper from covering his election night event on Tuesday. Mr. King, who is running for a ninth term, is locked in what is expected to be a tight race with his Democratic opponent, J.D. Scholten. Jeff King is a paid staff member on his father’s campaign. Ms. Hunter called the move “disappointing,” noting that by shutting out The Register from his event, Mr. King was also shutting out his constituents from access to his comments. Still, she said other news media outlets offered Tuesday to provide video of Mr. King’s remarks to The Register. “We will do everything possible to still provide comprehensive coverage for our readers in Iowa and across the country,” Ms. Hunter said. Mr. King’s campaign did not immediately respond to a request for comment on Tuesday night. Ms. Hunter said her reporters had not received any additional comment or correspondence from the campaign after getting the terse email response earlier Tuesday. The congressman has a history of making remarks seen as racist. But some of his recent tweets and other comments — including an endorsement for a Toronto mayoral candidate who had previously recited the 14-word manifesto used by neo-Nazis — have drawn especially critical rebukes. At least three large agriculture businesses have announced they will no longer support Mr. King because of his conduct. A public poll a week earlier showed Mr. King leading Mr. Scholten by a single point.